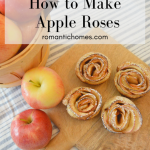 Read on for the recipe to roses you can actually eat! Fall is my favorite time of the year! There is a chill in the air, the leaves are changing color, festivals abound and the apple picking season begins. 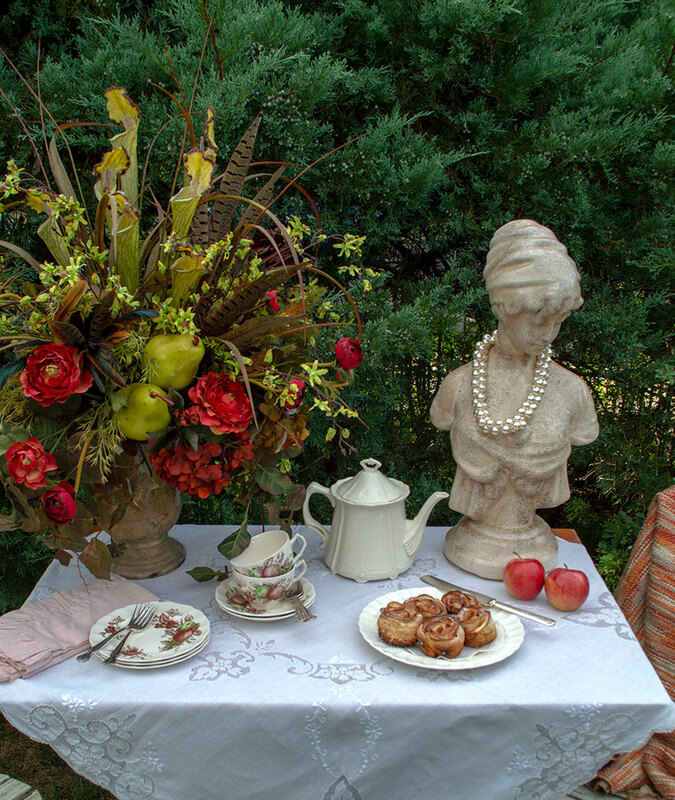 With a ton of orchards in our area, we can enjoy this quintessential autumn tradition. And who doesn’t love an apple dessert during fall? I for one always have a hard time saying no to fresh pie, especially when it’s a unique apple rose! 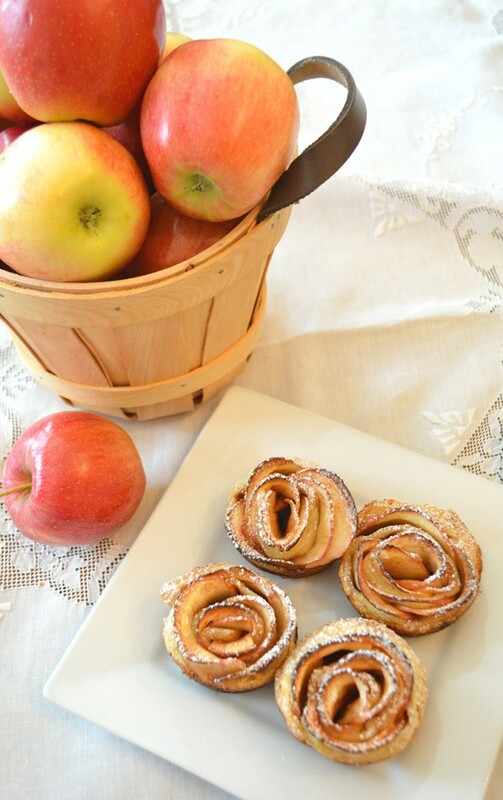 Apple roses are an individual pie, perfect for parties. As much as enjoy apple picking, I love baking even more. The apples are much sweeter, the temperature is cooler and aromas in the kitchen are heavenly. 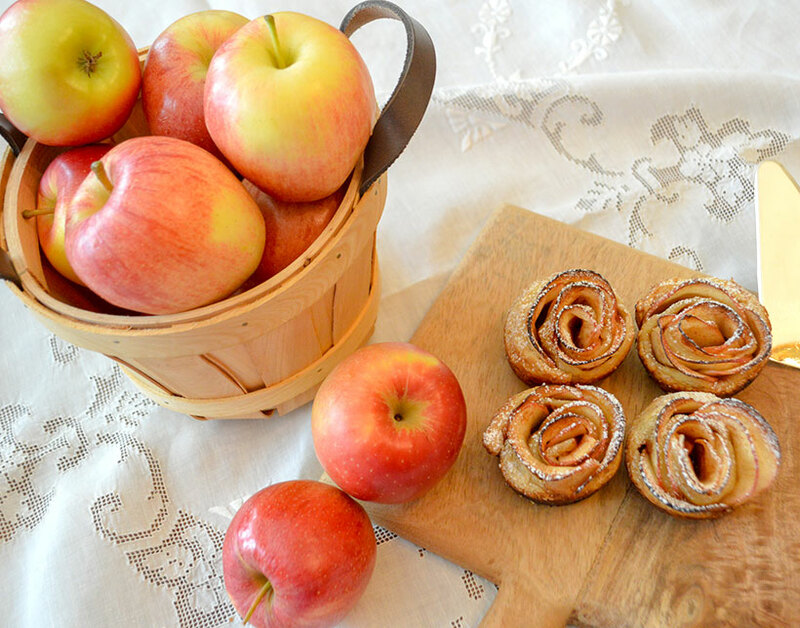 These beautiful apples roses are the perfect way to celebrate autumn. A tasty and easy dessert made with lots of soft and delicious apple slices, wrapped in puff pastry that has been flavored with cinnamon sugar. Below is the recipe. Happy fall baking! Thaw the puff pastry at room temperature if you haven’t done so yet. It should take about 20-30 minutes. Prepare a bowl half filled with water and the lemon juice. Cut the apples in half, remove the core and cut the apples in paper-thin slices. Leave the peel so it will give the red color to your roses. Right away, place the sliced apples in the bowl so that they won’t change color. Microwave the apples in the bowl for about 2 minutes, to make them slightly softer and easy to roll. If you prefer, you can also simmer the apple slices with the water in a small pan (on the stove). The apple slices should be cooked just enough to bend without breaking. If they break, you need to cook them a little more. Unwrap the puff pastry over a clean and lightly floured surface. Using a rolling pin stretch the dough into a rectangular shape of about 12 x 9 inch. Cut the dough in 6 strips, each about 2 x 9 inch. In a small bowl place the sugar and cinnamon and mix well. In another bowl, place three tablespoons of butter. Microwave until melted. Spread a thin layer of butter on each strip of dough. Sprinkle with cinnamon sugar. Preheat the oven to 375°F (190°C). Drain the apples. Arrange the apple slices on the dough, overlapping one another. Make sure the top (skin side) of the slices sticks a little out of the strip. Fold up the bottom part of the dough. Starting from one end, carefully roll the dough, keeping the apple slices in place. Seal the edge at the end, pressing with your finger, and place in a regular muffin cup. No need to grease the muffin mold if it’s silicone. Otherwise, make sure to grease with butter and flour or baking spray. Style a “bouquet” of your desserts on a pretty plate for the perfect presentation. NOTES: Make sure the pastry is fully cooked on the inside before removing the roses from the oven! If after the first 30 minutes the apples start to burn on top, move the pan to a lower rack of the oven and finish baking. You can also cover loosely with aluminum foil for these last 10-15 minutes, to avoid burning the top. Sprinkle with powdered sugar and enjoy! 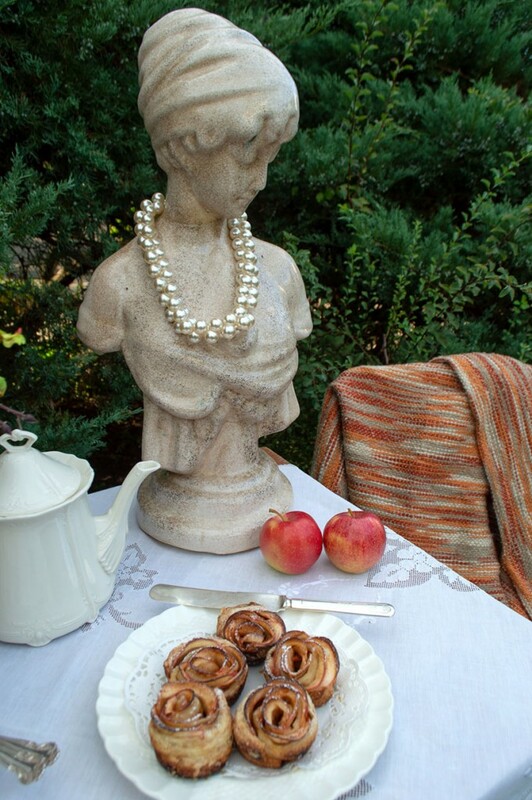 Janet shares more tasty recipes and beautiful tablescapes on her blog, Rosemary & Thyme. No need to cutting, dividing, special servingware or making sure each piece is the same size. These treats are perfectly sized for individual enjoyment.